"Ceviche can be made with vegetables for a vegan variation. In this Mexican recipe cauliflower, carrots, and tomatoes are used. Serve on tostadas or with crackers. [Recipe originally submitted to Allrecipes.com.mx]"
Place a steamer insert into a saucepan and fill with water to just below the bottom of the steamer. Bring water to a boil. Add cauliflower, cover, and steam for 7 minutes. Let cool and finely chop. 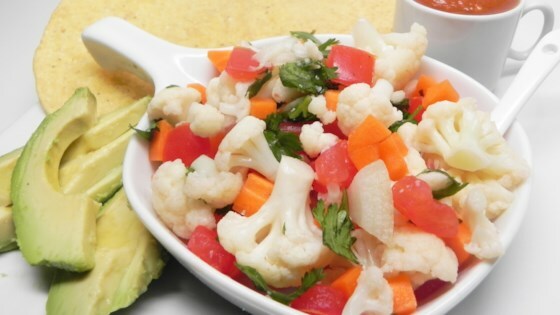 Place chopped cauliflower, carrots, tomatoes, onion, and cilantro in a bowl. Pour lime juice on top and season with salt. Cover and chill for at least 30 minutes. Serve garnished with avocado slices. See how to make a simple ceviche with imitation crab meat.